SACRAMENTO, Calif. -- Gov. 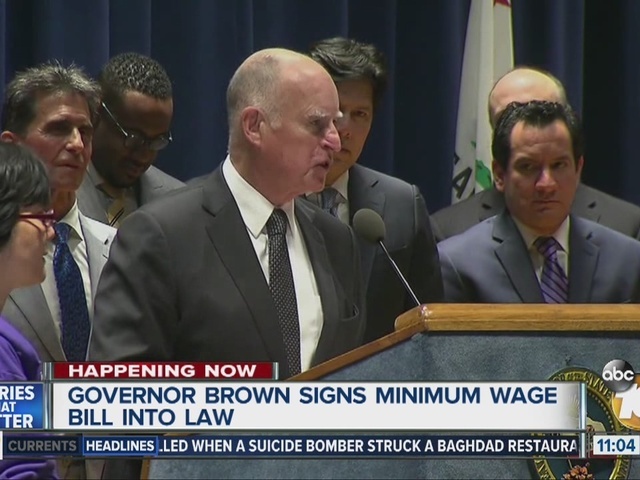 Jerry Brown signed a bill into law Monday giving California the nation's highest statewide minimum wage of $15 an hour by 2022. That and a similar effort in New York mark the most ambitious moves yet to close the national divide between rich and poor. Experts say other states may follow, given Congress' reluctance to act despite entreaties from President Barack Obama. "This is about economic justice. It's about people. It's about creating a little, tiny amount of balance in a system that every day becomes more unbalanced," Brown said before signing the bill at the Ronald Reagan State Building in downtown Los Angeles. Democrats who control the Legislature approved the compromise legislation Thursday, days after the agreement was announced. The measure passed with no Republican support. 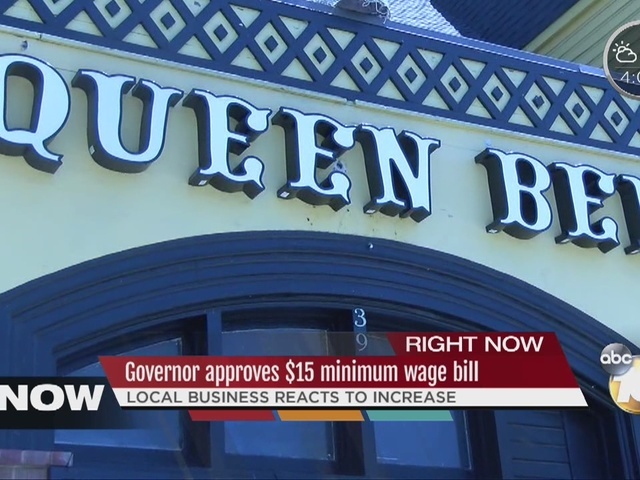 The bill will bump the state's $10 hourly minimum by 50 cents next year and to $11 in 2018. Hourly $1 raises will then come every January until 2022, unless the governor imposes a delay during an economic recession. Businesses with 25 or fewer employees have an extra year to comply. New York's state budget includes gradually raising the $9 minimum wage to $15, starting in New York City in three years and phasing in at a lower level elsewhere. An eventual statewide increase to $15 would be tied to economic indicators like inflation.